If you would prefer a pretty black nursing bra, we suggest the Heidi Klum Madeline Jet Black breastfeeding bra. Not only is it pretty, it also offers great support and is comfortable too. So what makes it so pretty? Well, it is adorned in lovely lace and is decorated with a charming bow. How about the structure? It is a wirefree bra and is non-padded. The cups and backs are lined with cotton lycra to help you get a better fit. This also will mean that you should find the bra more supportive too. To help you get a better fit it has a 6 hook and eye fastening at the back. 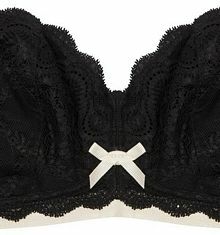 So why might the Heidi Klum Madeline nursing bra be a good choice? Well, if you are searching for something pretty and supportive, this may be the perfect bra for you.